Tandem Chillers Inc. manufactures ground source heat pumps for water source, air source and ground source cooling and heating. Even though the temperature varies from one extreme to another, from ice cold to a heat wave, the ground below our feet remains at a relatively constant temperature. Regardless of where you live, ground temperatures will always be hotter than the air above it during the winter and cooler than the air in the summer. Our ground source heat pumps uses this fact to our advantage by extracting heat or cooling from the ground and transferring it to your place of work or the comfort of your own home. Also called a geothermal heating system, our ground source heat pumps use the ground as both a heat source and heat sink. They provide heat or cooling by moving heat, rather than by creating heat like a furnace. Every system consists of three major subsystems or parts: a geothermal heat pump to move heat between the building and the fluid in the earth loop, an earth loop piping system for transferring heat between its fluid and the earth, and a distribution subsystem for delivering heating or cooling to the building. These heat pumps consists of a compressor and a heat exchanger that transfers heat from a body of cooler ground to a circulating refrigerant that is piped into a building. If it is being used to heat a building, the refrigerant in the coils buried in the ground extracts heat from the air and evaporates into a gas. The indoor coils release heat from the refrigerant as it condenses back into a liquid. A reversing valve, near the compressor, can change the direction of the refrigerant flow for cooling as well as for defrosting the outdoor coils in winter. WHY CHOOSE OUR GROUND SOURCE HEAT PUMPS? Tandem Chillers designed its first modular chiller with a limited number of scroll compressor chillers and screw compressor chillers. 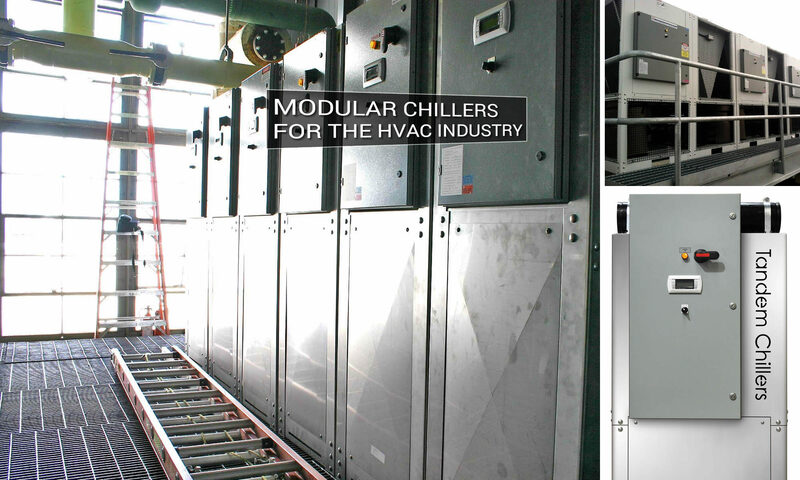 With the vast knowledge we gained over 40 years of process chiller design to the design of our modular chillers, you can be assured that our heat pumps are also of a sound refrigeration design and easily serviced. Our design is unique from other designs in so far as they can be serviced in place without shutting down the rest of the cooling or heating system. Our design makes so much sense that it is hard to see why our competition does not do it.